Published by Mountainblog on 01/18/2016 . Best choice for the worst case: Swiss mountain sports outfitter Mammut starts the winter 2016/2017 with a completely revised line of avalanche backpacks. 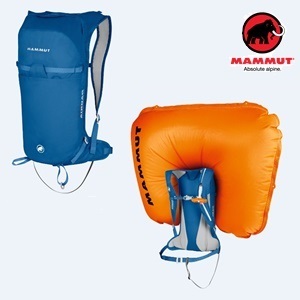 Both the airbag system as such and all backpack models have been optimized. The result: an extremely low weight at a high performance. The new airbag system 3.0 is so small and light-weight that you will not feel it when free riding or on long ski tours. The carrying system has become much more comfortable and the thought-through equipment equally convinces freeriders and ambitious tour hikers. There is no longer any excuse for doing without this potentially life-saving part of personal safety equipment away from marked slopes. With the new Removable Airbag System 3.0, the Ultralight weighs no more than a 1.5 l bottle. Taking out the Airbag System 3.0, it will only weigh a feather-light 500 g, while still offering enough storage space and all the necessary attachment options for demanding ski tours. The diagonal ski holder can be operated with the backpack put on as well at fast climbs. Lateral compression belts keep the backpack close to the body and improve fit. Pickax or poles can be attached on the outside, while the inside of the 18 l backpack offers space for shovel and probe as well as a drinking system. The rear zipper ensures comfortable access to the main compartment. The back padding can be taken out and used as a seat cushion during breaks.